Coyly looking down, Madame Recamier holds a veil across her chest. The sheath both demurely conceals and reveals her breasts. 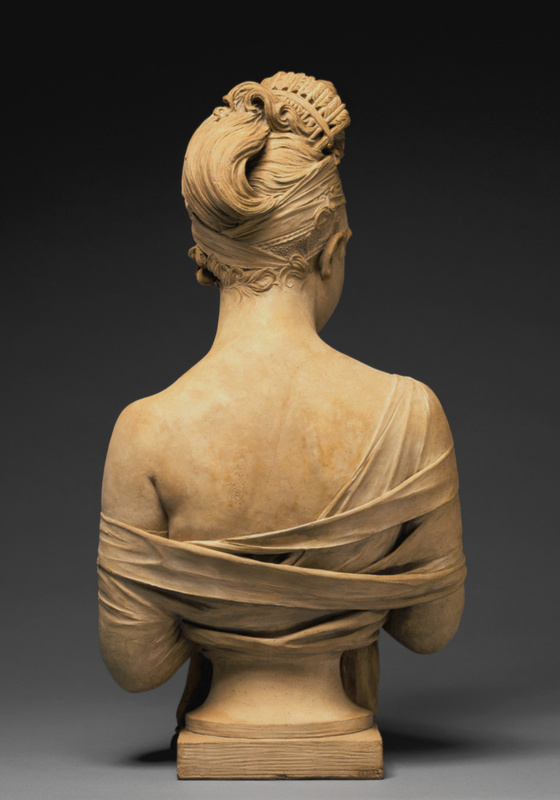 Sculptor Joseph Chinard cleverly compensated for the artificiality of the bust form by elongating the bust to mid-torso and covering the transition between the body and pedestal with drapery, creating a work of surprising naturalism. 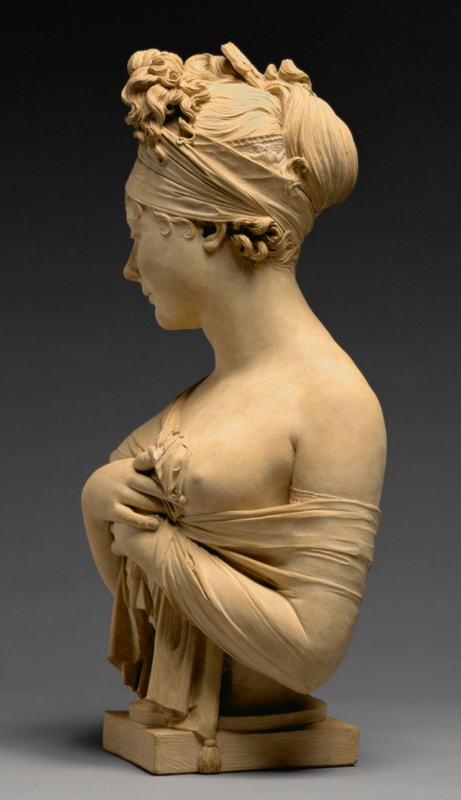 The softly modeled limbs and the slight twists of her head and shoulders suggest a living presence while the upswept hairstyle suggests Recamier's elegance. Juliette Recamier was celebrated in French Empire society for her beauty and love affairs. Married at fifteen to a wealthy lawyer who may have been her natural father, she had a loveless, unconsummated marriage and carried on numerous flagrant affairs, the most celebrated with the Prussian Prince Augustus, the youngest brother of King Frederick II. In her Parisian townhouse, she held a fashionable literary salon frequented by the political and educated elite. Some of the most accomplished portraitists of the era sculpted, drew, and painted her image. 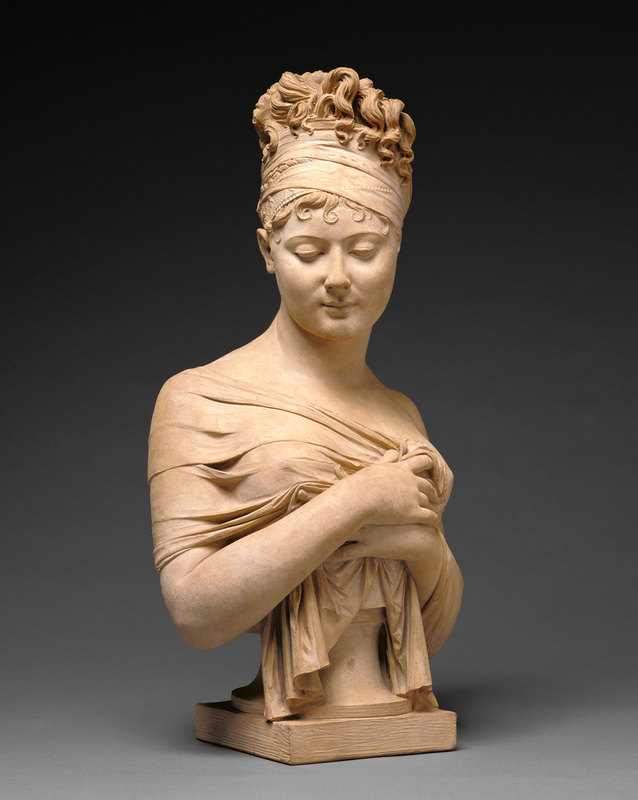 Chinard's terracotta bust, considered one of the most successful at capturing her spirit and beauty, was produced in several different versions in both clay and marble.